I love everything pimento cheese. I can't explain it because I wanted nothing to do with it when I was younger. So....my pallet has matured, or my mind is fading. 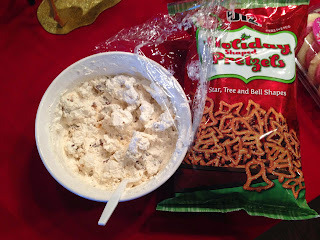 Whatever the cause of this adult love-this was a an easy recipe to throw together for any pot luck/gathering. I originally found the recipe on plainchicken. 1. Preheat oven to 425. Spray mini muffins. 2. Mix bisquick, sugar, buttermilk, and pimento cheese. Add a few T of buttermilk if the dough is too thick. 3. Scoop a heaping T into each muffin well. *Make your own buttermilk by adding 1 T of vinegar OR lemon juice to a cup of milk. Let is sit for about ten minutes. Then pour the amount you need for your recipe. I've gone to Brazil the last four years and each year...and it's as much of an adventure as you would imagine when you hear 'Amazon River.' The one thing I'll say about alligators, or at least those I've encountered-they aren't everywhere you look, and they are much smaller than I imagined. I'm sure that's not true for everyone, but...it was true for my experiences. Last year, before we headed off I made these little cookies for the team. I used my favorite cookie recipe and added some clear karo syrup (1 T per cup or 2) so that the icing hardens over night and the cookies can be bagged. I bought some thin elastic. You could add these to a bobby pin or clip, but....this was my prerogative. Here is the measurement chart I used. I then cut the two pieces (show above) out of felt. Here is a free pattern I put together to make these. The top one is the 'loops' of the bow, the bottom is the base. I added a glue dot to the middle of the base and placed the top on the glue dot. 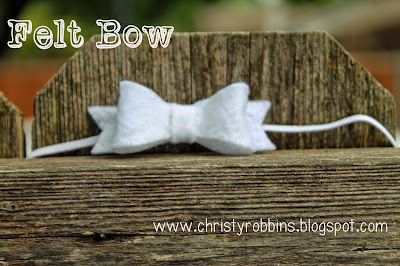 I then added more glue to the middle and folded in each side to form the bow's loops. I added MORE hot glue to the middle and pulled the little strip over the bow. I flipped it over on the back, where I glued the elastic, and I put MORE glue over the elastic and continued to pull the strip over to cover the elastic. I trimmed off the excess. I then used my fingers to press in the loops and make them fluffier. Right now I'm just making gifts for friends, but I may try my hand at a few things for sale-emphasis on a few. Stay tuned. In the meantime...a girly outfit for a little girl in Houston. I really thought I had tried bread every way you can serve it...including raw. I like it. I like it a lot. For Memorial Day my family grilled out. My brother attended said grill out. My brother is a Vegan. I'm having to get really creative when it comes to family meals+vegans. I googled/searched/and sent carrier pigeons out for grill ideas. I remembered some bread I had once in Hawaii. All good stories lead to Hawaii. I know they grilled their bread at that memorable meal, and it turns out you can actually grill bread outside of Hawaii. I bought a really dense (egg free bread). You can leave the eggs if you want-I'm not opposed. Sour Dough works well. I mixed about 1/4 c olive oil and 1 t. garlic salt (more if you like garlic, less if you don't) and I brushed each piece with my garlic oil mix. I just did one side. I put it on the grill (around the edge of the fire, not directly over it) and I flipped it about 2 minutes in. Just leave it on until you start to see the grill marks (about 2-3 minutes on each side....depending on how hot your grill is). It. Was. Delicious. It was toasty goodness...and for a minute-I thought I could be a vegan. Then I remembered I like cheese. A lot. Today I'm headed to Good Morning, Texas to do some book themed crafts. This is one of three projects. I'll post the video later here. Recently, we were cleaning out some books in our school library and tossing out some books that were missing their covers etc from too much lovin'....this is a good thing for a reading specialist. I cut down a page from the trash bound Charlotte's Web to the size of a pencil. I covered the pencil with mod podge and then rolled the paper around it. I smoothed it down, cut the excess off and added a little more mod podge to close it off. It doesn't get much easier than this, and it would be really cute with old dictionary pages as well! I wish I loved vegetables. I don't. I do, however, find I really like squash when done right. Here's a way to do yellow squash right...and I should know b/c....most of my life is about eating vegetables done wrong...or rather, trying to. 1. Place squash and onion in a skillet over medium heat. Add a small amount of water. 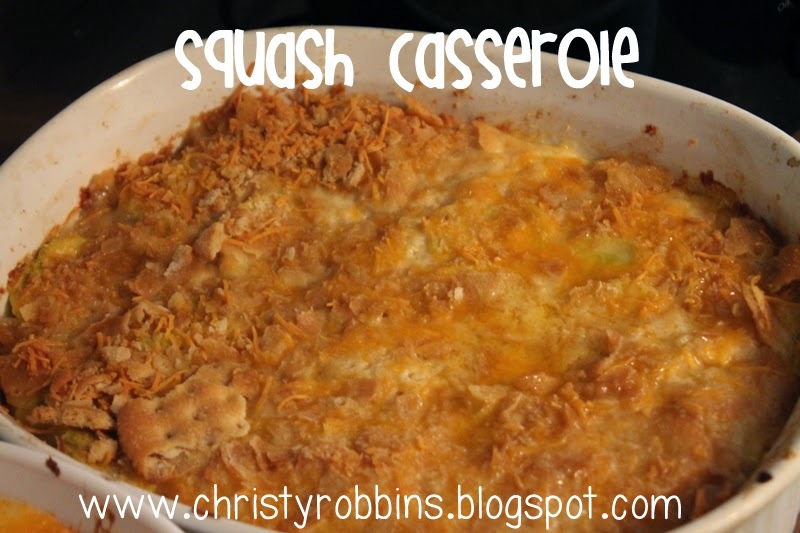 Cover and cook for about 5 minutes (until the squash is tender). Drain and then add to a bowl. 2. In a second bowl mix the cracker crumbs and cheese. Stir half of the cracker mix into your bowl of squash and onion. 3. Into squash and cracker mix, add the butter, and salt. Spread in a 9x13 inch baking dish. Sprinkle with remaining cracker mix. Dot with 2 T of butter. 4. Bake at 400 for 25 minutes until lightly brown. I'm a fan of oatmeal. This was a tasty treat I tried out and really loved. It was just the right mix of sweet and savory. 'Tis the season for fruits! I actually halved the recipe, but the full recipe would easily serve 8. Instructions: Spray 8x10 casserole with cooking spray. 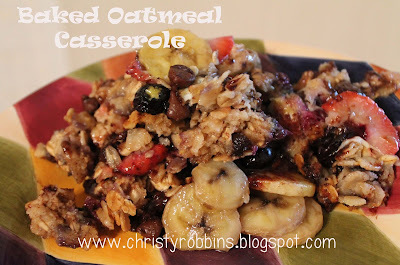 Mix the oats, brown sugar, baking powder, cinnamon, salt, and half of the chocolate chips, and half of the berries. Stire and pour into dish. Add the other half of the chips and berries to the top. Top with bananas. In another bowl mix the milk, eggs, melted (and cooled) butter, and vanilla. Whisk and pour over the top of the oatmeal mix (make sure to cover all of the oats). Bake for 30 min at 375. Add 1 T of brown sugar to the top of your dish and bake another 5-10 minutes until the top is browned. *I found the original recipe at Love of Family & Home. I tried this out for the first time about a year ago and fell in love. The problem with most pies is the crust to filling recipe....this fixing all of that and then some. 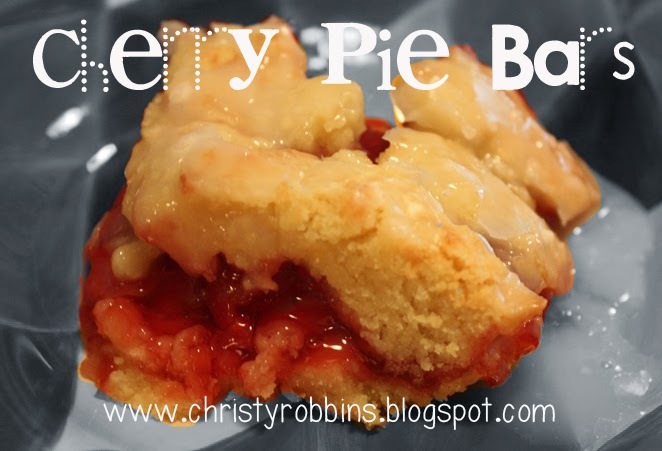 I also think it's about 18,568x's easier than the typical pie crush. 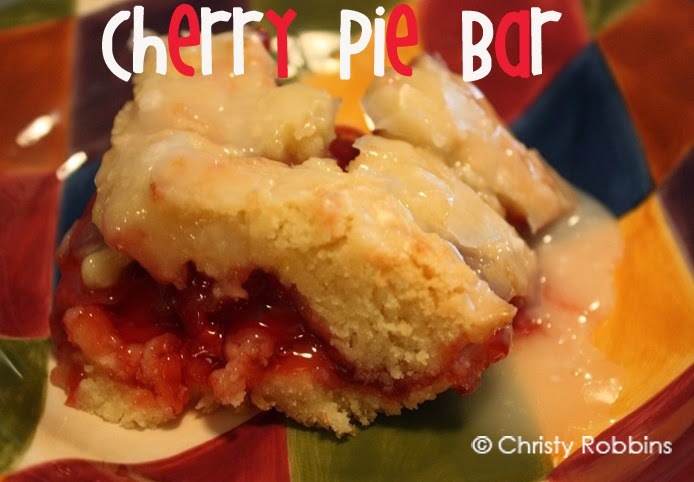 So....with Cherry Pie in demand as summer goes into full swing...here's a little pot luck dish option. It's also totally find to make this at 2 am and eat it all by yourself too. 1. Cream butter and sugar then add the eggs and beat. Add vanilla and almond extract. 2. Mix in flour and salt. 3. Grease a 9x13 pan and spread 3 c batter. Cover with pie filling. Drop remaining batter on top of pie filling. 4. Bake at 350 for 30-35 minutes or until toothpick comes clean. Cool. Combine glaze ingredients and drizzle over the bars. I brought this recipe to a luncheon last summer....and was asked for the recipe by quite a few people. This usually lets me know-it's a hit. 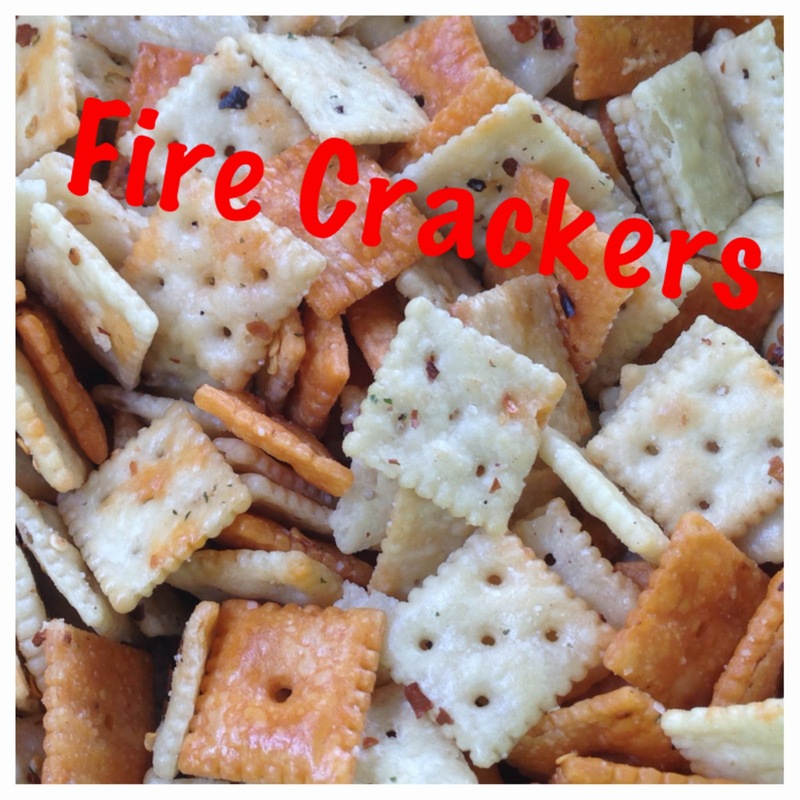 It was the easiest cracker recipe I've tried (no oven required-a plus in the heat of the summer). You can use any mix of crackers, but I like the small saltines and cheese its. Bag them up and take them with you to a picnic. Instructions: Mix everything but the crackers and then pour the dressing mix over the crackers. Toss several times over the space of an hour. Store in an air tight container. Do not place these in the fridge. Let it sit overnight to soak up the seasoning. Some of the oil may pool at the bottom, pour it out. I recently got a Plum Paper Planner (I get nothing for letting you know about my new toy, I only wish I did). There is a page at the beginning of each month called 'notes.' I haven't totally decided how I want to use it, but....I see a lot of folks using pages like this for 'dash boards.' 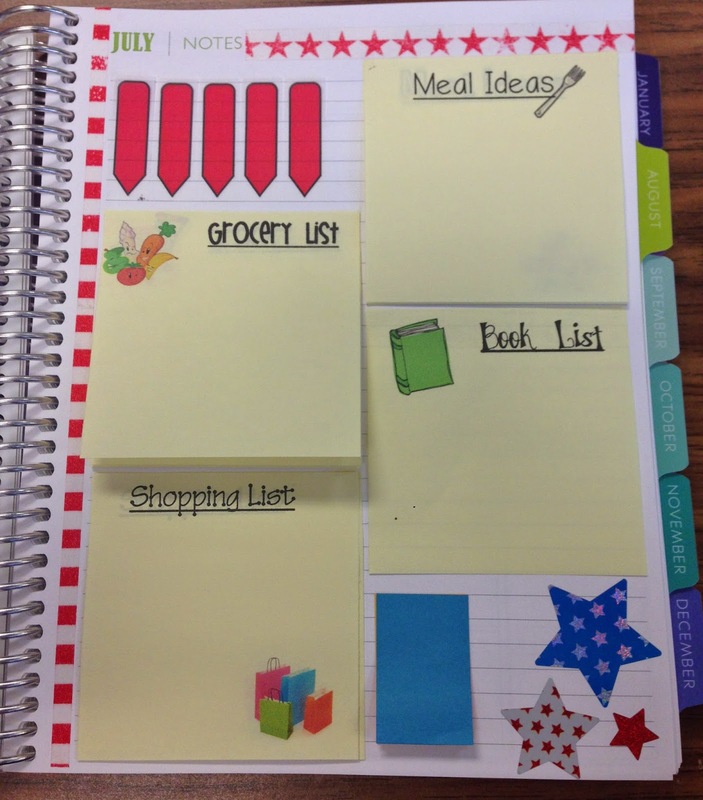 I decided to do the same, but to create some post it's I can move around. I posted a video for how I made my personalized list here. I also have a free printable if you want these same choices here. 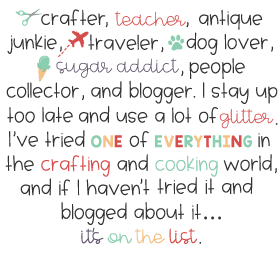 I keep an ongoing list of meals I want to try, books I want to read (that are coming out that month), things I need to get at the craft store etc, and a grocery list (not to be confused with the shopping list b/c crafts take up a whole different part of my checkbook). 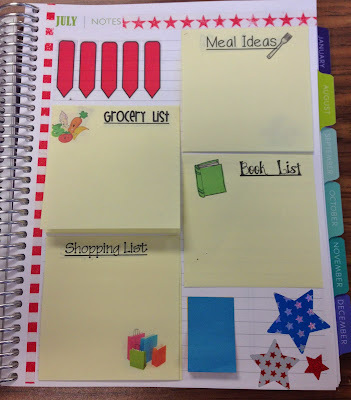 The new verb in my life is planner. My friend, Tammy got a planner for Christmas and has been youtubing her planning adventures. These plum paper planners are somewhere between a calendar, to do list, scrapbook, and diary. This happens to be right up my alley. I've been pretty terrible about all of the above lately...minus the to do list. I make to do list daily-truly, and carry one in my purse. I lost it for a day this past year and thought I might need a straight jacket. I shouldn't be able to lose this big girl. I'm sure you will hear more about it. If you don't know about the world of planning....it's me and you both. Here is my video alllll about my new obsession. 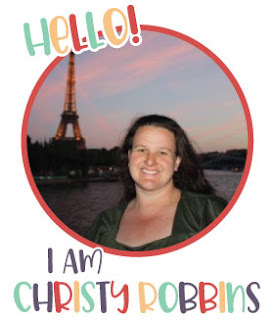 I also made some free printables if you beat me to the obsession. You can download them here. I get nothing for saying this....I just really love a good planner. I wish I got lots of freebies so....hook a girl up! I love globes, but throw in a war somewhere and your globe is quickly obsolete....which means...you can grab a ton of these at thrift stores for a real steal. My friend Kelly did just that, and she brought me her prize. I've actually wanted to paint a globe for awhile....I've got one in mind for myself, but this one is for Kelly. It was a pretty ugly globe to begin with, but I did like the color of the stand. So, I bought a blue paint I liked and painted the ugly/retired map. I used a pencil and scribbled over the back of the papers/over the letters (you could also do this with a piece of graphite). I then turned it over on the globe and traced each letter with a pencil and the graphite left a mark on the globe that I then traced over with a gold pen...or three. Apparently I need to learn to ration ink a little better. After that, I added a bunch of constellations in gold and some random stars in white. They are kind of sort of, not really in the place they would be in the sky....as long as you don't ask an astronomer. Unfortunately, in this case, that is exactly what Kelly's dad loves doing, so....this globe I'm sure will be a real conversation piece for the critics out there, but.....I can live with that.